Unfortunately the book is downstairs, so I will edit this later to give the description from the back cover. I am 3/4 through this book. Eh, I’m not sure what I think yet. I will decide after I have finished it. A serial killer is hunting the Pacific Northwest, murdering victims in a gruesome and spectacular way. The local police suspect “monsters” are involved, and have called in Anita Blake and Edward, U.S. Marshalls who really know their monsters, to catch the killer. But some monsters are very real. The Harlequin have been the bogeymen of the vampire world for more than a thousand years; they are a secret so dark that even to speak their name can earn you a death sentence. Now they are here in Ameerica hunting the weretigers…and human police. The Harlequin serve the Mother of All Darkness, the first vampire. She was supposed to be dead, but only her body was destroyed. Now she needs a new one, and she’s decided that Anita Blake’s is the body she wants. Edward thinks the serial killings are a trap to lure Anita closer to the most dangerous vampire they’ve ever hunted. The vampires call Edward “Death” and Anita the “Executioner,” but Mommy Darkest is coming to kill one and possess the other, and she doesn’t care how many others have to die along the way. 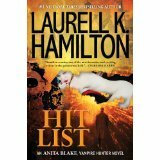 This entry was posted in Book of the day and tagged Anita Blake, Hit List, Laurell Hamilton, vampire, werewolves. Bookmark the permalink.